The British Columbia Ferries have made a useful and bold move to include GPS data for their ferries to the public. The data is available both on their desktop and mobile website. While the information is still short of real-time GPS tracking, updates to the data occur about every two minutes, this is still a good move for users of the service. The data will help users make informed decisions about when to leave work or home for the ferry and decrease the overall amount of user unhappiness when ferries are late due to weather or mechanical issues. 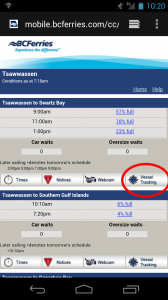 Users have access to ferry name, destination, heading, and speed from the tracking interface. When using the desktop version of the site users must simply hover their mouse over the ship icon (represent as an arrow pointing in the direction of the ships heading). In our tests of the mobile interface we were unable to produce any of this pop-up information. User must also go to another part of the site in order to access estimated times of arrival (ETA).